I recently decided that since I (try to) cook every night, and it’s usually just me eating, that it may be a good idea to start inviting friends to join me. So, I showed my printed menu plan to a few friends and told them that if any of it looked good to them, they were welcome over any night. Let’s just say a couple of them have been at my house for dinner one night each week since then. My friend Ande requested these specifically for Monday night, and we made plans to meet and walk before her boyfriend joined us for dinner. The only downside to this new arrangement – I was forced to watch The Bachelor. They are lucky that stuffed myself stupid with these taquitos and didn’t have the energy to run screaming from my living room at the insanity that was playing out on my television. All I can do is shake my head and be thankful I am not crazy like the people on those shows. I mean, c’mon – who really wants to have 25 (or however many they start off with) girls/guys put in front of them, and have little-to-no time to spend with them and then have to choose ONE? I think that would be a nightmare. What if I liked them ALL?!?! And to be one of those 25 people fighting for the attention and affection of ONE person…uh uh, not this girl. You have to be ten kinds of crazy to put your life out there on tv like that, and ten times more crazy if you believe you’ll find true love that way. It’s worked for what, one couple out of the gazillion seasons. I don’t have the capacity for that kind of crazy. Just sayin’. But, what I am crazy about are taquitos! These in particular. Baked, cheesy deliciousness with an avocado dipping sauce. It doesn’t get much better than that, my friends. If you are of The Bachelor watching persuasion, you should have a watch party, and make these 🙂 Your guests will be overloaded with delight for these AND their fav show! Preheat oven to 350 degrees F and line a large baking sheet with foil, set aside. Heat a skillet over medium-high heat and cooked the chopped bacon for 4-5 minutes, until browned and crisp. Remove to a paper towel to drain. Drain the bacon grease from the skillet and return to medium-high heat. Season chicken breasts with salt and pepper, and cook for 2-3 minutes per side, until cooked through. Remove the chicken to a bowl or stand mixer and shred. Add the bacon and cream cheese to the shredded chicken and combine. Add about 2 tablespoons of the chicken mixture to the center of each tortilla and roll it up. Set each tortilla, folded side down, onto the prepared baking sheet. Bake for 15-20 minutes, until golden brown and crispy. Meanwhile, place the avocado in a bowl and mash it with a fork. Add the remaining ingredients and stir until smooth. Taste and season with additional salt and pepper, if desired. 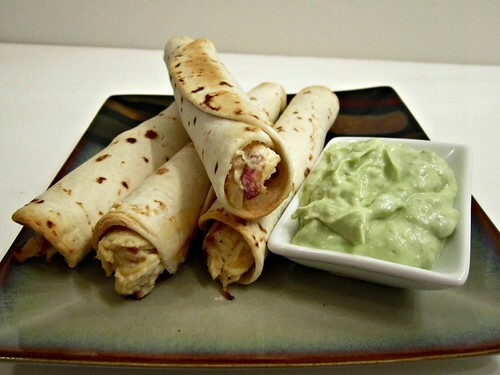 Serve with taquitos for dipping!